Megaton Rainfall is a First Person Superhero Game. You control an indestructible interdimensional superbeing with an immense destructive power and faster-than-light flying capabilities, and your mission is to save the Earth from an alien invasion. Accelerate from 0 to mach 10 in 5 seconds, fly around a real-size-Earth, get out of the atmosphere, the solar system and even the Milky Way in less than 1 minute from any location. You can destroy entire skyscrapers (unintentionally) when you miss your target... Just like the aliens, if you let them to do so. Megaton Rainfall was released on Xbox One 255d ago in the UK. Based on 1 Megaton Rainfall review, Megaton Rainfall gets an average review score of 85. 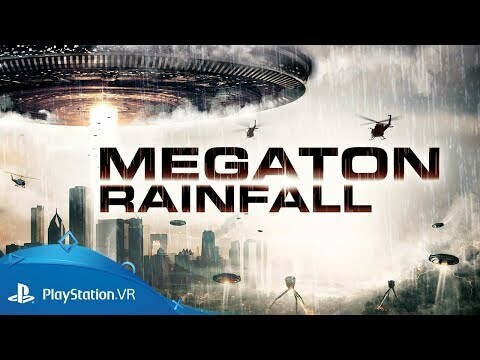 A thunderously stylish arcade shooter with spectacle to spare, Megaton Rainfall is a must-have for PSVR owners. Developer Spotlight - Alfonso del Cerro, Pentadimensional Games!